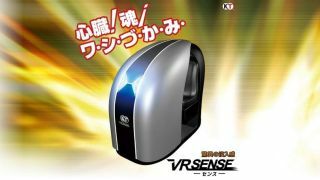 Koei Tecmo Wave, the game developer behind the Dynasty Warriors franchise, has just unveiled an interesting possibility for the direction of virtual reality – a VR arcade cabinet. Called VR Sense, the cabinet, as you’d expect, contains VR headsets for players to put on. It’s the 'sense' part of the name, however, where things become less self-explanatory but significantly more interesting. The VR Sense will contain VR headsets, a “multifunction 3D seat” and several other features that will engage all the senses of the player, with, it seems, the merciful exception of taste. It’ll do this in several ways, according to the GameCity site: the 3D seat will be able to move players within the enclosure to simulate walking or running, a wind function will simulate the breeze when moving at different speeds, a temperature function will make the player feel appropriately hot or cold and a mist function will replicate the feeling of rain. There’ll also be a scent function that will be able to generate smells from the game’s environments, such as a musty dungeon or a fresh forest. Less appealingly, the touch function has apparently been designed to reproduce the feeling of spiders or rats crawling over your body. If you thought VR made horror games more frightening with the addition of the headset, we dare you to step into one of these. The machine will launch with three different game experiences. GI Jockey Sense, which will enable players to experience what it’s like to race a horse through all weather conditions (minus the chafing); Horror Sense, which will no doubt bring all of those creepy crawly touch features into play; and a VR version of Dynasty Warriors which will, according to the company, include a “realistic reproduction of hot flames covering the battlefield”. The machines have been designed as pay-per-use experiences that will feature in arcades from this Summer. Images from Game Informer show that they make use of PS VR headsets. It’s likely, though, that they’ll be limited to Japanese amusement centers before they’re released to wider markets, if they ever are.